I have been searching for an old "double bass" instrument to photograph for some future paintings. I have been fortunate to have had the opportunity to take pictures of the beautiful Amati violin on my previous post, as well as the cello. 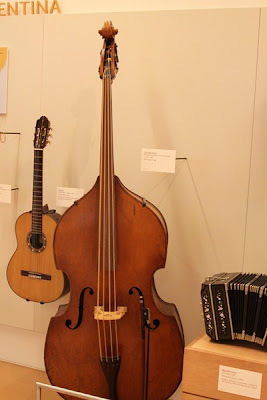 I am still looking for the "double bass" to paint a full sized piece, but in the mean time....I also am so lucky to live so close to the new "Musical Instrument Museum." 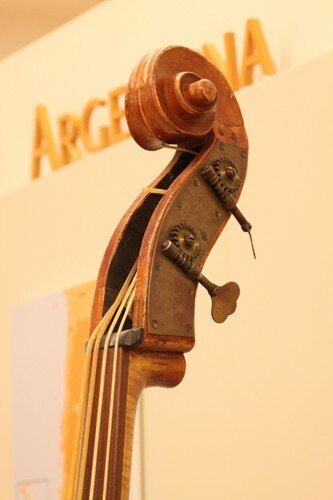 This museum called the "MIM" is the most wonderful museum and collection of musical instruments from every country in the world. Last spring I took some pictures there, (which they let you do as long as you do not use the flash) I photographed the beautiful old "double bass" below. At the MIM - "double bass"
This instrument "double bass" was labeled probably from Germany or Czech Republic dated from 1930 - 1945. It had so much character and I wish I could know and hear it's history. 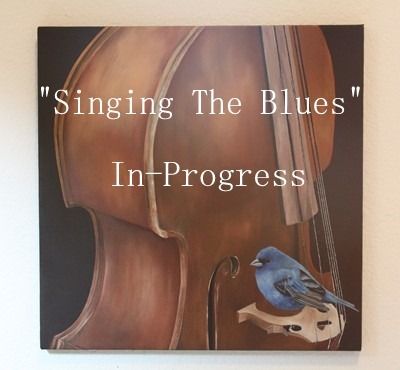 I decided to just focus in on the center (bridge) part of this instrument for my painting "Singing the Blues." This painting in-progress measures 14 x 14". It will be for an upcoming show in Tucson Arizona in November at the "Jane Hamilton Gallery." I'll post more info on that next month. Check back in again soon to see the progress on the new painting "Singing the Blues." You can also click on the comment link to leave a comment or message. Thank you.